My sister and I have always had a theory that every man has an ideal cookie (or maybe just every man in our family). Ben’s favorite cookies are oat free, very blonde, and tall. Bekah’s cookies never ever run into each other on the baking sheet, preserving a barely baked likeness to the dough balls that went into the oven. When my husband and I were dating/engaged, I went on the quest to find his ultimate favorite cookie. I had never been much of a cookie eater, so I didn’t make them much. I got his mom’s recipe for starters, but I ended up making them over and over again until I got them just the way he likes. While he loves cookies of all varieties, he even specifies the brand of chocolate chips that should be present in his ultimate cookie! Well, here it is to share with you all. This recipe makes a truckload of cookies, so I recommend freezing doughballs. In large mixing bowl, cream together 1 lb. unsalted butter, 2 c. light brown sugar, and 2 c. sugar. When it is all incorporated, beat in four eggs, one at a time. Continue beating until it is light yellow and a little fluffy. Mix in a couple teaspoons vanilla. In a separate bowl mix together 4 c. oat flour (I grind oats in the food processor), and 5 c. all purpose flour, 2 t. baking soda, 2 t. baking powder, and 1 t. salt. Dump that into the butter mess, and mix until all flours are incorporated. Add in one whole bag of Guittard semi-sweet chocolate chips and half a bag of milk chocolate chips. Shape into balls the size of golf balls and bake in a 375 degree oven for about 12 minutes. Let cool a little before diving in. As I look at the picture, I must admit I love your time bake. The new digital ones reset if the power goes out (This is especially bothersome if it happens during service and someone is coming over afterwards for a meal); the old analog ones may be a bit delayed by the outage but turn on as soon as the power comes back on. Some “improvements” just aren’t better. I’m glad to see that I’m not the only one who only uses Guittard semi-sweet chips. There’s only one store in town that sells them so I stock up every time I’m at that store. I always love to try a new cookie recipe. Thanks so much for sharing. They sound delicious. I have to “smuggle” the Guittard chips into Canada, and have done so from time to time. They are worth the trouble, according to my family. We will be making these today using butterscotch chips in place of the white chocolate, as I have sons who say demeaning things about white chocolate. I have to heartily vouch for this recipe. Our family got hooked on them last year, and I mean hooked. I can’t get past them enough to make any other cookie. For now, all cookies are dead to me, except these. strong words I know, so you better try them, we think they are that good. Thanks Rachel for finding Luke’s Best, they’ve become our best too. maybe in time we’ll be able to try another recipe. ha! Just to clarify – is that a 1 lb bag of choc chips? Has anyone tried just using oats instead of oat flour–no food processor here? In case anyone wonders, as I did, how big a “truckload” is… I halved the recipe and got almost 4 dozen cookies. My friend Casey makes these with straight oats, and they are great. The texture is different, but it definitely works. Good luck! Woops Franci – I didn’t see your question there. Sorry! It is the standard 12 oz. bag of semi-sweet plus 6 oz. of milk chocolate. Thanks! I have the butter sitting out now–softening. Can’t wait to try them. It WAS a truckload! These are great for giving to friends, there is such an abundance. And the switch to butterscotch chips did not take away any of their appeal. The three plates I set out for the ten kids at my house today were GONE before we knew it. I also made your bagettes, and that was just the greatest bread my family has ever tasted. It really is delightful to see a table full of satified and thankful people you love, so…… thanks for the bread recipe, while I’m here appreciating you. 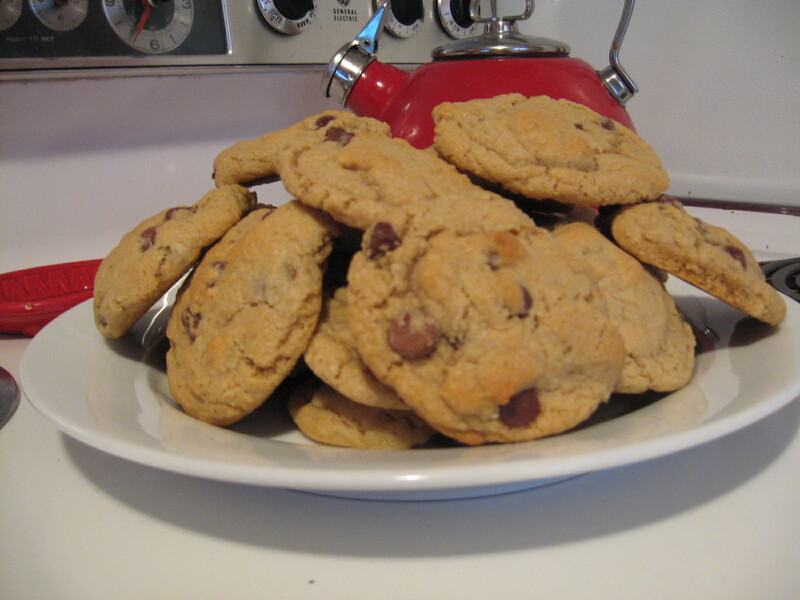 Oh boy, these are SO good, even when you make them with inferior chocolate chips! Can’t find Guittard choc chips here, so I thought I’d make up for it by using 1/3 dark chips, 1/3 milk chips and 1/3 white chips. They’re a hit! Thanks for posting the recipe. I think I have finally found THE choc-chip cookie! Yesterday I made them a bit different, and I reckon they turned out very, very good. I added 200g (7 oz) each of dark, milk and white choc chips (but these are more like flat buttons than chips). I also added a cup of chopped roasted hazelnuts. They are yummilicious! Two years later…I love these! They are my favorite. Even better than my Name-Your-Ritzy-Store Urban Legend Cookies. Many thanks for sharing. My husband and girls are becoming real cookie and milk fans – we’re in the UK, and I’m not sure that we do Oat flour… do you make it up yourself mixing flour and oats? Would love to try these as trying to find a great cookie receipe. I just grind up oats in my food processor. Good luck! These are the best cookies in the world. The end.